Any bleeding is later pregnancy is most likely to indicate a problem with your placenta. If you are bleeding, you will need medical attention. Placental abruption is the most common cause of bleeding during the second half of pregnancy and is often associated with abdominal pain or tenderness. Placental abruption is when part, or all, of the placenta separates from the wall of the uterus before the birth of your baby. The amount of bleeding varies and the cause is not always known. Sometimes, there is no bleeding but you will have sudden and severe abdominal pain. Treatment may involve monitoring you and your baby, bed rest and in more serious cases, the birth of your baby. This is when some or the entire placenta implants in the lower part of the uterus, instead of being attached to the top part of the uterus. 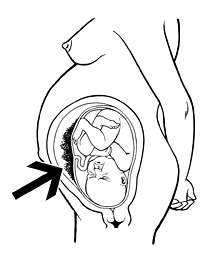 When the cervix starts to open or if the uterus contracts, the mother (not the baby) can bleed from the placenta. It can be quite serious and generally you will be admitted to hospital for careful monitoring of you and your baby. 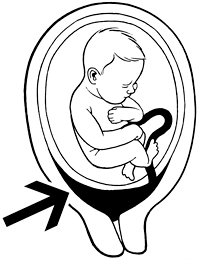 In most cases you will need a caesarean birth.